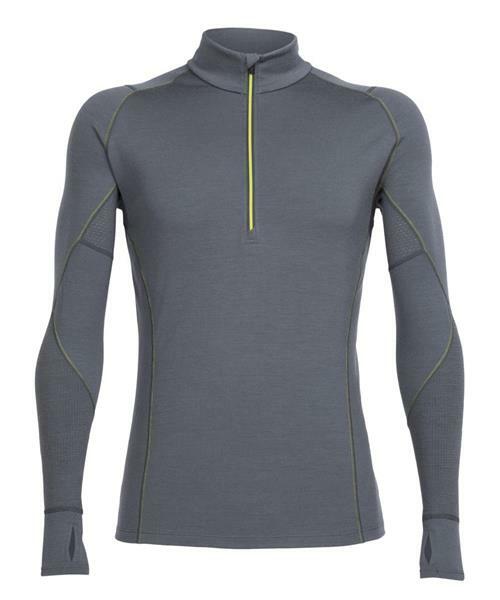 A midweight baselayer zip shirt with optimized venting zones for active performance, the Men’s Winter Zone Long Sleeve Half Zip is a technical top for highly active days in cold conditions. Fully functional for warmth, ventilation, and support while alpine climbing, backcountry skiing, or other day-long adventures in the wild, the body features 260gm merino wool fabric with a touch of LYCRA® for stretch and a deep front zip for easy heat dumping. In the underarm panels Icebreaker used lightweight, 180gm eyelet merino mesh that actively controls temperature during high-output pursuits, and in the higher-wear areas around the elbows and forearms they added 230gm merino and polyester waffle jersey for added abrasion resistance. Flatlock seams throughout eliminate chafing during fast-paced days. Winter Zone LS Half Zip - Mens is rated 4.9 out of 5 by 21. Rated 5 out of 5 by Jughead from long walk in the cold rain Bought the pants and shirt for a Kilimanjaro trek in December, decided to try them out on a 19 km back packing trip to the back country of BC. Rain and very cold temperatures made the trip a real challange. This gear was sweet to get into once we got out of the rain and into the tent, next day I decided to keep it on and continue the walk to Della Falls. Kept me warm all the way, aired it out on the tent for an hour and popped it back on for the night around the fire. Never smelled even after five days of minimalist camping and trekking. I highly recommend this gear. It's light yet warm, and a comfortable bit of kit for camp life. I will be buying one more set for my Africa trip. Rated 5 out of 5 by Mastadon from Nice base layer! But expensive. Great base layer! Expensive, but if you are passionate about base layers get this product! At the end of the day, I think you could buy 3 base layers for the price of this, and although they wouldn't be as awesome, they are just base layers (assuming you have a really good coat). Plus consider all base layers have a life span. You definitely get what you pay for with this...a great quality product! So like I said, if you are passionate about base layers...but if feel buying a quality coat is important, and you have to choose, I would opt for the coat. Rated 5 out of 5 by HRider from This shirt helped me survive the mountain pass Just returned from a late season motorcycle trip and am very happy with my purchase. I typically wear a medium but purchased a small for a snug base layer fit. The shirt is very comfortable with no chaffing or binding. I wore the shirt in riding temperatures from 28c to 2c. Adding or removing a second layer as needed. The saving grace was the final day of riding. Over a mountain pass at night in at times what felt like a monsoon. The ride was extremely challenging. Being warm and dry enabled me to concentrate on the road and my surroundings. I was amazed to find myself/body completely dry when I finally reached shelter. This shirt breathes as it says it will. My next purchase will be compatible leggings. I see glove liners are also available. These will also be on my list as I have discovered my gloves are a bit of a weak point. Rated 5 out of 5 by KubieZ from This shirt has comfort, warmth and style True to size. I'm 5' 11 and slim. the Medium is a perfect fit for me. As per almost all of the similar icebreaker base layers ( and i have quite a few at this point) , it's my go to base for aggessive alpine skiing. Sheds sweat away so i'm always dry in it. I've been skiing Lake Louise over the past month in 0 - 20 Degree weather and it's been great as a base from subzero to freezing. This is another excellent icebreaker product. Rated 5 out of 5 by kk13 from best one ever i m a framer and work outside all year so winters in alberta can be really cold and honestly after trying a lot of differents bran, i finally found that one, i tried it and i loved it i ll never going to get something else and my next purchase will be for an other merino icebraker bottom one. the money that cost me was really worth it! Rated 5 out of 5 by officeskibum from Early review The shirt has a great fit. As a tall and slender person with long arms, it is awesome to find clothing that actually fits. Super comfortable. Warm without being hot. Nice styling for a base layer (can be worn as a light sweater). Rated 5 out of 5 by Backtoskiat40 from Perfect for skiing I purchase the BODYFITZONE WINTER ZONE LONG SLEEVE HALF ZIP specifically for skiing and I am not disappointed at all. The fit is great. You have a great amplitude of movement. The warmth is definitely there. Rated 4 out of 5 by coldalberta from Great option to stay warm in Utility enviroment this is a great shirt to use when you need to stay warm, and when working in an arc flash environment the 100% wool is the only option.